John Mullins is an Associate Professor of Management Practice in Entrepreneurship and Marketing at the London Business School. He earned his MBA at the Stanford Graduate School of Business and his Ph.D. at the University of Minnesota. An award-winning teacher, John brings to his teaching and research 20 years of executive experience in high-growth retailing firms including two ventures he founded and one he took public. 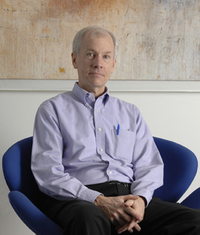 Since becoming a business school professor in 1992, John has published four books, numerous cases and more than 40 articles in a variety of outlets, including Harvard Business Review, the MIT Sloan Management Review, and tJohn Mullinshe Journal of Product Innovation Management. His research has won national and international John Mullins is an Associate Professor of Management Practice in Entrepreneurship and Marketing at the London Business School. He earned his MBA at the Stanford Graduate School of Business and his Ph.D. at the University of Minnesota. An award-winning teacher, John brings to his teaching and research 20 years of executive experience in high-growth retailing firms including two ventures he founded and one he took public. Since becoming a business school professor in 1992, John has published four books, numerous cases and more than 40 articles in a variety of outlets, including Harvard Business Review, the MIT Sloan Management Review, and tJohn Mullinshe Journal of Product Innovation Management. His research has won national and international awards from the Marketing Science Institute, the American Marketing Association, and the Richard D. Irwin Foundation. He is a frequent speaker to audiences in entrepreneurship and venture capital. John’s now legendary first trade book, now in its fifth edition, The New Business Road Test: What Entrepreneurs and Investors Should Do Before Writing a Business Plan, is the definitive work on the assessment and shaping of market opportunities. His book, Getting to Plan B: Breaking Through to a Better Business Model, co-authored with Randy Komisar, a partner at the esteemed venture capital firm Kleiner Perkins Caufield & Byers in California, was named to “Best Books of 2009” lists by BusinessWeek and INC Magazine. John's book, The Customer-Funded Business: Start, Finance, or Grow Your Company with Your Customers' Cash, has been called "mandatory reading for every entrepreneur before even thinking about seeking angel or venture capital funding"; in it John offers the most sure-footed path to starting, financing, or growing your venture.